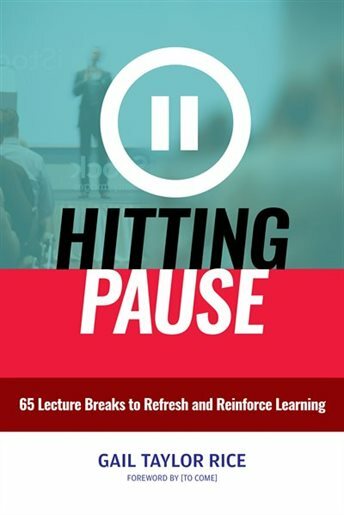 Hitting Pause by Gail Rice will appeal to faculty members who want to enhance student learning without, however, totally restructuring the way they teach. The premise of the book is that by making small changes to lectures—basically by adding interactive pauses—teachers can “create engaging cooperative learning experiences and improve learning outcomes,” p. 16. More specifically, Rice acknowledges her debt to two psychologists, both of St. Louis University, Karen Wilson and James H. Korn, citing these two principles from their work: “Shorter segments of instruction are better than longer ones, and students who pause periodically to actively participate in instruction will learn better than those who don’t,” p. 4. Significantly, the pauses involve not mere silence, but more importantly, collaborations that engage students in meaningful, often fun-filled, activities. The book, Hitting Pause, has many strengths. Two key ones are the research to back up Rice’s premises and the many examples to encourage implementation. The book provides research-based evidence to support the validity of interactive pauses. The evidence permeates the book. It appears up-front in several introductory chapters that outline the many benefits of pausing, including student peer feedback to reinforce learning and the retention of learning through student interactions. Rice explores concepts from cognitive science that maximize these benefits: (1) creating a positive learning environment; (2) promoting metacognition through pauses that encourage students to think about their learning; and, (3) adding surprise and unpredictability through effective pauses. Subsequent chapter headings emphasize the benefits of the three pauses tied to their timing in the lecture: Chapter 3: Starting Pauses Focus Attention; Chapter 4: Middle Pauses Refocus Attention; and, Chapter 5: Closing Pauses Capture Learning. These three chapters, like earlier ones, also illustrate different pauses by offering specific examples. Two additional chapters provide evidence for the value of opening and closing pauses, punctuated with clear, engaging examples. As noted, these numerous easy-to-implement examples will encourage faculty members to adapt Rice’s suggestions. Icing on the cake are 65 final examples, broken down by their placement in the lecture, 23 starting pauses, 14 middle pauses, and 26 closing pauses. These are all systematically laid out with headings such as “setting for use”; “characteristics”; ”procedure”; “additional suggestions” ; “online adaption”; and “key references and resources.” It is particularly refreshing to see the attention paid to online learning settings, a facet of teaching approaches often overlooked. A third and final strength rests on the book’s high literacy: it is well-written. The examples are clear and often illustrated by explanatory diagrams. Anecdotes of genuine teaching scenarios are bolstered by interesting, informative dialogue. In summary, this informative book, Hitting Pause, should prove useful to faculty members who are just starting out, but it should also be an inspiration to experienced teachers who want to enhance the lecture approach they are already familiar with.